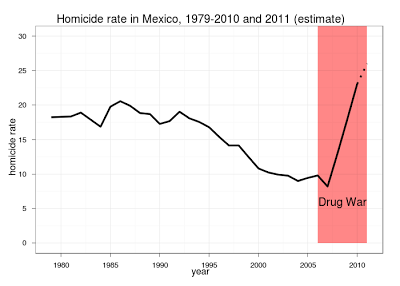 Recently the Mexican government released to the public the final homicide data for 2010, and as you can see from the chart Mexico has suffered from a steep rise in homicides since 2008, and in 2010 reached the highest homicide rate in recent history. 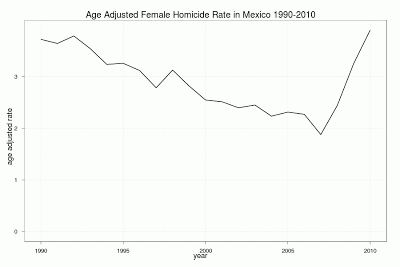 The Mexican government had actually released preliminary homicide data a couple of months ago, but I though it looked incomplete so I didn’t blog about it. For some reason (too much ponche?) 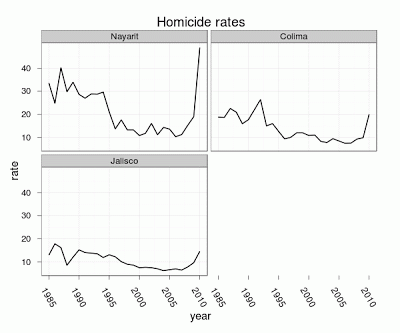 the INEGI hasn’t issued a press release with the final data —including more than 1,000 previously uncounted homicides. Hopefully they’ll do it sometime soon. 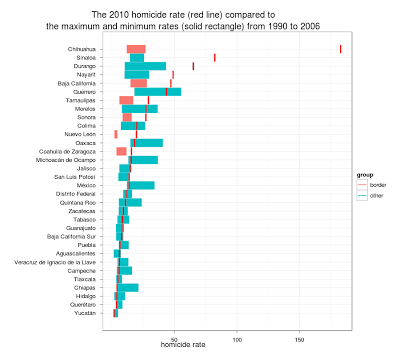 México had an homicide rate of 23 in 2010. There has been a steady growth in the increase in violence each year since 2008: from 2007 to 2008 homicides grew by 5,300, the next year they grew by 5,600 and in 2010 they grew by 6000. The 55 bodies found in the mass grave in the municipality of Taxco were not recorded in the database (not even as accidents). In the drug war-related homicide database 55 deaths were recorded during the month of May. 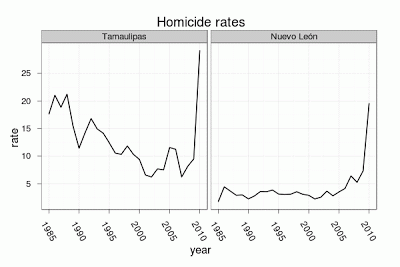 There were an unusually high number of deaths of unknown injury intent in the state of Tamaulipas, and many parts of the state had more drug war-related homicides than total homicides. In the muncipality of San Fernando 72 immigrants were killed in August, but only 51 deaths were recorded in the database for that month. In the drug war-related homicide database 89 deaths were recorded during August. Obviously these problems deserve a more rigorous analysis. 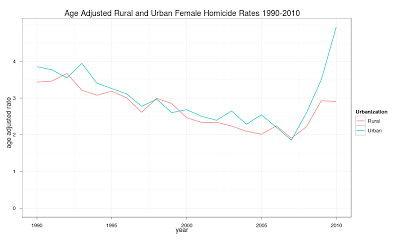 For comparison purposes the most violent state in the US, Louisiana, had a homicide rate of 11 in 2010. In southern and central Mexico violence rose in Morelos and to a much lesser extent in the State of México and the Federal District. 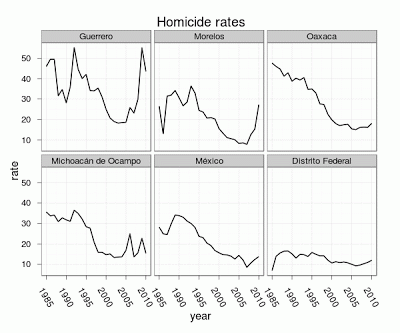 Sadly, while Michoacán and Guerrero saw violence decrease in 2010, all the available information points to an increase in violence in 2011 as the capture of “La Barbie” and the split of La Familia Michocana with the Caballeros Templarios led to an unraveling of alliances between drug gangs. Since the rise in violence in northeastern Mexico was so sudden it would point to at least some level of organization and vertical integration in the Zetas and the Gulf Cartel (only in México obviously). In Nayarit, Colima, and Jalisco violence had started rising since 2008 when “El Mochomo” was captured, but it reached a whole new level in 2010 due to the kidnapping of one of the sons of “Nacho Coronel,” the death of “El Chaguin,” and the split of the Milenio Cartel in two. Nayarit actually had to start summer vacation early because so many shootouts were occurring. Since there were no military operations in these states previous to the escalation of violence this would be evidence against the theory that the violence in México is mainly the byproduct of the military coming in and unraveling local crime markets by taking over police duties. 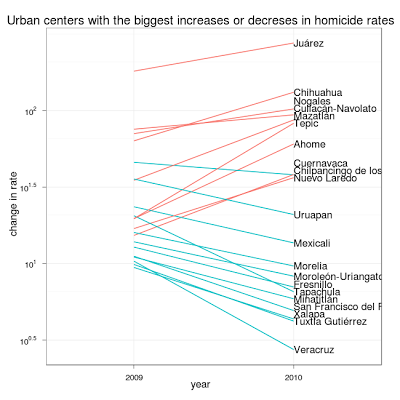 In northwestern Mexico violence kept on rising, and if you’ve been reading my blog you won’t be surprised to know that the number of homicides rose in the municipality of Tijuana by about 10% from 2009 to 2010. Hopefully in 2011, with Leyzaola gone, violence will finally go down in Tijuana. In Ciudad Juárez there were a total of 3,800 homicides (3,684 in the database), but there were 193 deaths of unknown injury intent, there are only 400-500 deaths by accidents each year in Juárez and 2010 wasn’t anything out of the ordinary, so many of those deaths of unknown intent are likely to be homicides. Coming up with an exact number is complicated. Whichever the true number, the metro area of Ciudad Juárez with a population of 1.3 million had more deaths than the states of California and Texas combined. What’s weird about the 2010 homicide number in Juárez is that at first the Fiscalía del Estado put the number of homicides at around 3,000, but much later in 2011 corrected the number to 3,600. 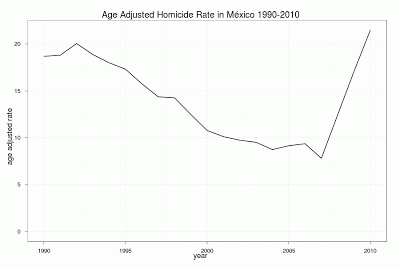 This is something to keep in mind with all the talk of Juarez becoming less violent in 2011. Numbers can be updated, and I wonder if the whenever the drug-war related homicide database is updated it will reflected the newer homicide data. 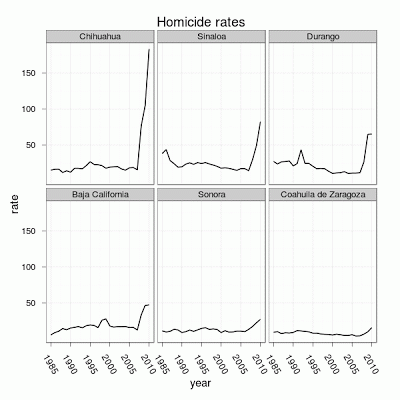 In both Chihuahua and Sinaloa homicides were the main cause of deaths beating Ischemic heart disease. 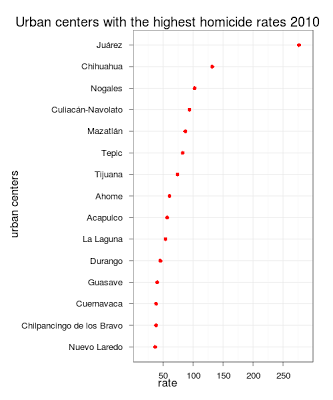 For calculating which “cities” in mexico are the most violent I used the metro areas as defined by the INEGI, adding a made up metro area of Culiacán-Navolato, plus those municipalities which are not part of a metro area but have a population of more than 200,000 people. It’s always tricky to do comparisons across countries since cities in the US are geographical concepts akin to localities in México but with local governance (municipalities would be the equivalent of counties), and as such, only a small percentage of the people present at a given locatility/city/town actually live there, so as a first approximation it is better to use the concept of an integrated economic region—the metropolitan statistical area. 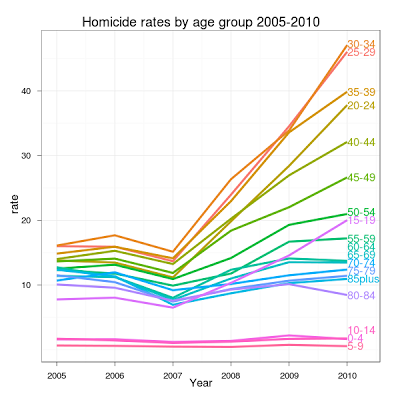 New Orleans-Metairie-Kenner had a homicide rate of 21 in 2010. 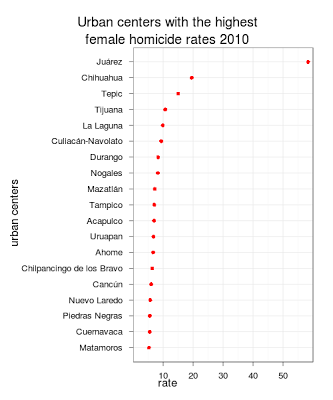 Ciudad Juárez is a clear outlier in female homicides, a female homicide rate of 58 is unbelievably sad. 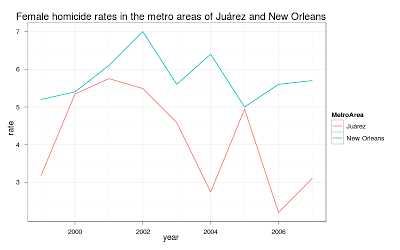 Since Juárez had a reputation for being a killing ground for women since before the drug war, I again did a comparison with the metro area of New Orleans (parishes of Jefferson, Orleans, Plaquemines, St. Bernard, St. Tammany, St. Charles, and St. John the Baptist) using data from the CDC, and while you can argue just how accurate the population estimates for both cities are and whether all homicides were recorded properly in Juárez, I don’t think it’ crazy to claim that before the drug war Juárez was safer for women than New Orleans. 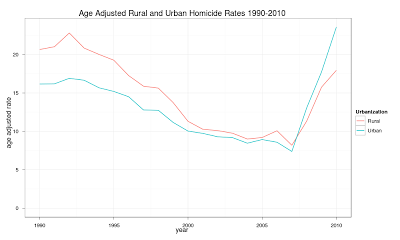 Note the rapid rise in the homicide rate of 15-19 year olds. 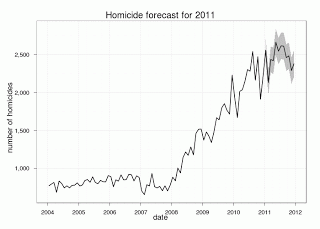 Hopefully in 2011 violence didn’t rise quite as much as in the previous years.